The Time Elevator Jerusalem is a journey through the rich 3,000 year history of Jerusalem. 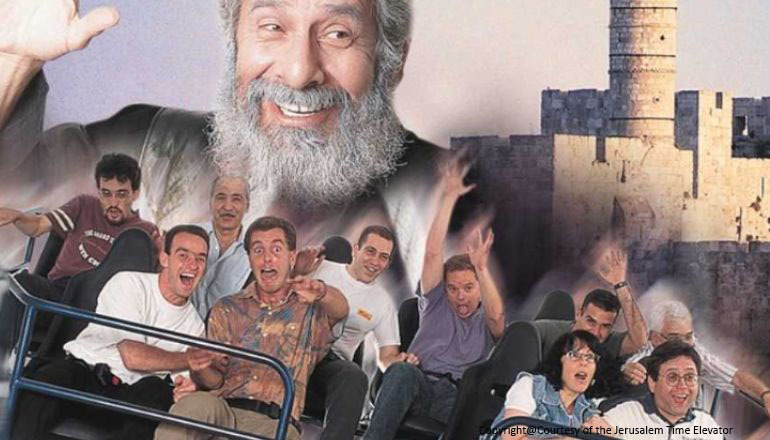 Star of “Fiddler on the Roof,” Chaim Topol plays the lead character who amid crashing ceilings, leads us on an unforgettable journey moving through Jerusalem’s historic turning points; beginning with the City of David and ending in the 1967 Six-Day War. Combining film, motion platforms, , this 30-minute journey brings Jerusalem’s most dramatic moments to unforgettable life through an original screenplay written in conjunction with leading historians and archeologists. Audiences will witness Prophet Jeremiah’s confrontation with King Zedekiah and relive the destruction of the First and Second Temples. They will be led through the Roman Conquest, the birth of Christianity, the emergence of Islam with its centuries of long rule over the Holy Land and the drama of the establishment of Israel. Combining motion based seating, panoramic screens, visitors have the sensation of viewing the movie as a participant rather than a spectator. Surround sound headsets enable the show to be concurrently heard in English, Russian, French, Spanish, German, mandarin; Italian and Hebrew. "I am Jerusalem" is an artistic, innovative and international multimedia performance that takes you on a multi-sensory experience through the different time layers of Jerusalem. kinetic projection theater that alters its dimensions throughout the show. Here you will go on an electrifying journey of sights, sounds, people and scents, to the Jerusalem of today, of yesterday and of tomorrow. The Jerusalem of the heavens and the Jerusalem on earth. The show is suitable for ages 5 - 99, and everyone will find their own special connection to the city, their own “ I am Jerusalem". Come and experience the sensation of "I am Jerusalem", your visit to the city will never be the same.